Modern elegance meets traditional craftsmanship in this handsome cherry wood wall clock. With geometric lines and natural materials, this handsome clock pairs classic American craftsmanship with contemporary style. Designer Leonie Lacouette has been making clocks by hand for over 30 years, turning raw metals and woods into one-of-a-kind creations. 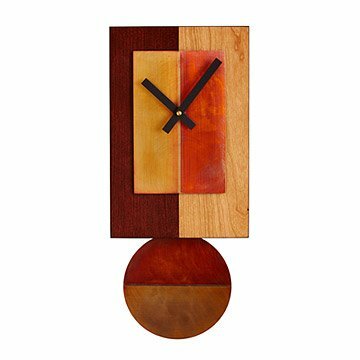 This striking rectangular wall clock features a two-toned cherry veneer finish, with a raised clock face and pendulum of hand-patinated copper. Utilizing modern quartz mechanisms, this gently swinging timepiece adds movement to your decor. Handmade in Wallkill, New York. Leonie Lacouette manages to strike a balance between concepts and influences that otherwise might seem like polar opposites—her elegant clocks successfully reconcile the strict geometries of minimalism with a warm, approachable palette of colored patinas on the copper and nickel that predominate her designs. Over 25 years ago Lacouette started making clocks as a practical way to make a living while using the aesthetic training she’d received in art school. It all began when she needed a clock for her studio, and noticed an ad in a magazine for a company selling clock mechanisms. Ordering five, she used one to make her own timepiece, and then made four more to sell. They sold out immediately, and she’s been making clocks ever since. Dust with soft, dry or damp cloth. No abrasive cleaners please. Not recommended for high-humidity areas such as bathrooms or screened porches. Very nice work of art. Looks really good in our living room. This is a beautiful and unique clock. The colors are so pretty and it looks so pretty in my dining room. I needed something dramatic but not too big: this is it. The fact that it keeps time is just a bonus. The pendulum not swinging is not a problem, as the clock works just fine as the wall decoration I wanted. It is just beautiful and I am pleased. Striking design on this clock. Even more beautiful in person than it is in the picture. I love the modern design and the colors and size. I had a wood clock for the past 20'years and when it broke I was looking for one that was completely different than any others I had seen. This fit the bill perfectly. I owned on of this artist's other clocks for years and have loved it. I was so excited to see another one I could purchase. It is truly beautiful functional art that I never get tired of looking at.